Flamborough's rich history goes back thousa nds of years, far beyond written records, but there is evidence that invaders or settlers crossed from mainland Europe over the centuries and left their mark here. A race known as the Beaker People came in the Bronze Age from about 2,000 BC because pieces of their distinctive pottery have been found at Beacon Hill, which overlooks Bridlington Bay south of the village. Ancient flint tools and arrowheads also show that people lived on the headland a very long time before that. Remains of Roman pottery have been found and there are theories that they had a signal station at Beacon Hill or near the lighthouse. They were in the Bridlington area and it would be logical to come the extra few miles for such a panoramic view over the sea. Danes Dyke, the spectacular two and a half mile ravine that separates the outward five square miles of the headland including the village from the rest of England, it a massive ancient earthwork shrouded in mystery. The southern half was formed by nature but the rest up to the cliffs in the north was dug by men who threw the excavated earth on the Flamborough side for a high defensive bank to protect against attack from the west. One theory is that the artificial half was dug by the Angle invader Ida who landed his army here from a fleet of ships in 547 AD. When the Vikings came between the 8th and 10th centuries they would also use it for defence, and maybe did more work on it, hence the name. However, someone before the Angles and Vikings could have created it and they simply followed. More has happened here than we will ever know. The origin of Flamborough's name is unclear but one speculation drawn from an Icelandic saga is that it comes from Flayn or Fleyn, brother of the founder of Scarborough, because a medieval name of the village was Fleyburg. Another guess is that it comes from a Norse word for spear because the headland is like an arrowhead pointing out to sea. 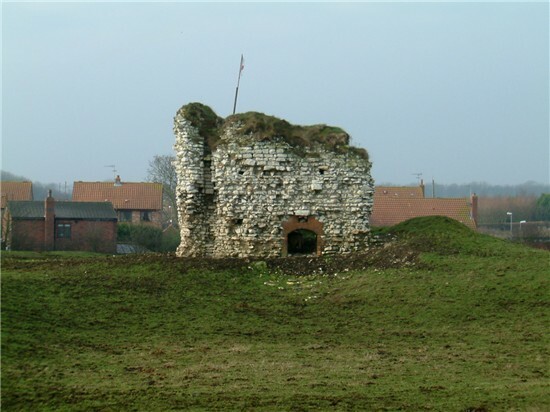 By 1066 when the Normans came, Flamborough manor was owned by King Harold who died at the battle of Hastings. Norman rule led to the Constable family from Chester settling here in the twelfth century and they stayed 400 years. They built their great house across from the parish church of St Oswald's, which they may also have built. All that remains of the house is the old tower, now a white stone ruin in Castle Field near the village centre, but humps in the ground where other buildings stood will surely attract archaeologists to explore more fully in future. The Constables got royal permission to crenellate - make battlements - in 1351. In their time there was a pier at South Landing on Bridlington Bay used by traders and fishermen but after Sir Robert Constable was executed in 1537 for his part in the Pilgrimage of Grace uprising it fell into disrepair and eventually disappeared. Flamborough produced a chancellor for Elizabeth I in Sir John Puckering, who went to London to study law, became a barrister, an MP and Speaker of the House of Commons and was made Lord Keeper of the Great Seal by the Queen in 1592. However, village families who go back furthest from today and make it unique are those of fishermen. For many centuries they overcame perils and hardships of living a mile from the sea with no harbour, only two launch-and-land beaches in gaps in high cliffs and, because they were on a headland, rapidly rising seas and exposure to gales and sudden North Sea storms in small open boats. Until marine engines came in the 20th century, drowning was a major cause of premature death. Engines for vehicles as well as boats brought profound changes in the 20th century. They enabled Flamborough men, previously limited to fishing daily from the headland in small open oar-and-sail cobles, to go five miles to Bridlington Quay and sail in much bigger boats with engines from the harbour. However, a few cobles still use the landings and stacks of crab pots and gear can be seen outside village houses. In earlier times cottages were built of chalkstone from cliffs and beaches and thatched with wheat straw from headland fields but most older buildings of today were brick-built in the 1800s. Headland roads and village centre streets are almost unchanged from centuries ago except that tarmacadam has replaced broken stone surfaces. Features as well as the church and castle stump include signs of medieval fishponds near the main road into the village, the old lighthouse built in 1674 and the new lighthouse nearby which dates from 1806. Least changed of all are the towering chalk cliffs, the millions of seabirds that nest in them especially in spring and summer, and the caves and small sandy or rocky inlets that have attracted thousands of visitors since tourism began. They remain a prime attraction today. Volume Three, Flamborough in the Twentieth Century 1900-2000.